I just tried out Max-Freeze and I love it. I have always had bad joints and have had a lot of trouble with muscle cramps and pain. Max-Freeze is a lifesaver. I just spray it on my joints and muscles aches and it starts to relieve the pain almost immediately. It gives you this cooling effect almost like putting ice on your joints and then the muscles begin to relax and loosen. It has some great nutrients in it like Aloe, tea tree oil, and vitamin E. I love that when I use it I’m also applying some key essential oils to my skin as well. This can is a continuous spray so you can apply a thin layer easily and you don’t have to use your hands at all. It is not greasy though so even if you do get it on your hands it’s not oily or greasy at all. It’s a really great product and I love the packing, the bottle makes it easy and convenient to use. 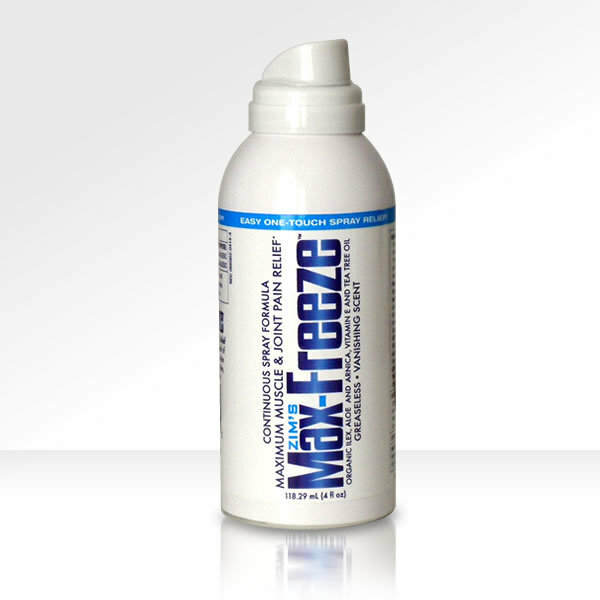 Zim’s Max Freeze in an easy, one-touch spray! Note: Orders containing Zim’s Max-Freeze must be shipped UPS Ground. You can purchase it on Zim’s Website!